When explaining the benefits of adding Trigger Point Dry Needling to a patient’s physical therapy care we often hear the question, “Well, is that like acupuncture?” Although the same type of needle is used in both treatments the origin, science and procedure differ. Trigger point dry needling is based on Western medicine and a clinical musculoskeletal exam for physical therapists. The practice of trigger point dry needling consists of inserting a very fine needle into in area of the body that is causing pain and typically contains a trigger point, or a muscle “knot”. The needle is inserted into the actual muscle with no injectable solution, leading to the name dry needling. Typically, patients do not even feel the needle penetrate the skin because it is such a fine needle. However, once the needle is advanced into the muscle, the amount of discomfort can vary from patient to patient. Typically, a more shortened or tight muscle will be more sensitive and the patient may experience a cramping sensation, called a twitch response. This twitch response is what your therapist is looking to achieve in order to release the trigger point. The twitch response results in a deactivation of the trigger point, leading to reduced pain and aiding to restore normal muscle length and function. Typically, positive results are seen within 2-4 treatment sessions but can vary depending on the cause, length of symptoms as well as the patient’s overall health. In contrast, acupuncture is an ancient practice of Chinese medicine that can be traced back at least 2,500 years. The general theory of acupuncture is based on the idea that there are patterns of energy flow through the body that are essential for health. The flow of this energy has been termed as Qi, pronounced “chee.” Qi moves throughout the body along 12 main channels called meridians, which represent the major organs and functions of the body. Although meridians do not follow the exact pathways of nerves or blood flow, disruptions of this flow are believed to contribute to disease. Acupuncture works on the theory of correcting Qi imbalances at an identifiable acupuncture point close to the skin. The most thoroughly studied mechanism of stimulation of acupuncture points is penetration of the skin by thin, dry needles. We do not perform acupuncture here at Specialized Physical Therapy. However, acupuncture may be a beneficial adjunct to your treatment and you should speak with your therapist for questions regarding your specific complaint. 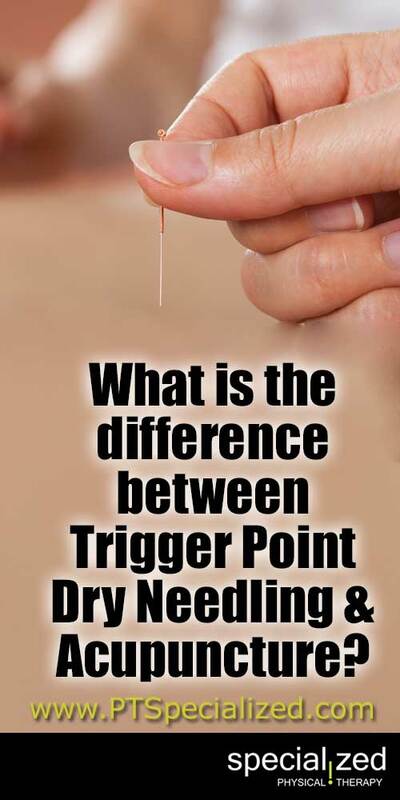 If you would like to learn more about how trigger point dry needling can help you, just give us a call at 720-493-1181!